At beginning of the year 2018, planet Saturn is in Sagittarius sign (7th house for Gemini sign) and Jupiter is placed in 5th house. 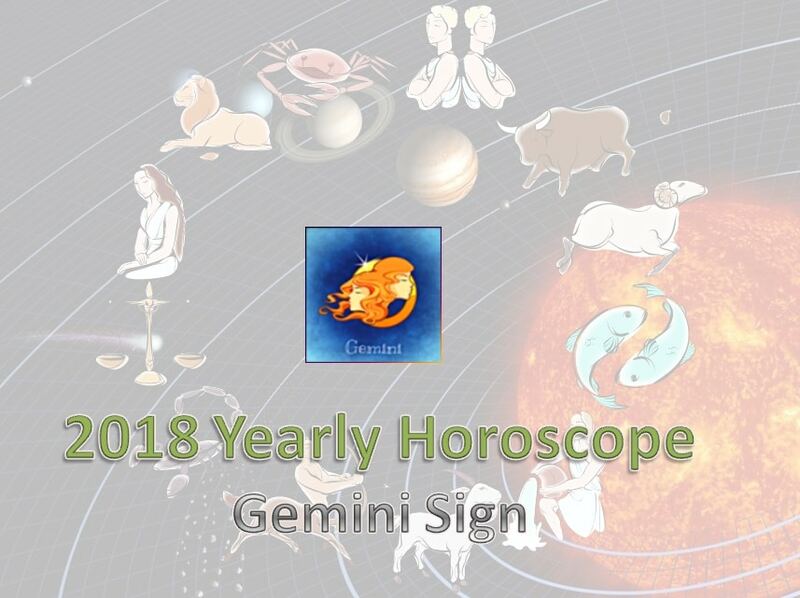 The year 2018 brings in prosperity and cheer for Gemini sign. There is no particular trouble from the planets as they are favorably placed this year for your moon sign. From the start of this year, the planetary positions are positive for 2018 yearly horoscope for Gemini sign, hence you can welcome this year with enthusiasm. The Geminis will have good cash flow and economic stability throughout the year. As your 5th and 9th House are in a beneficent position, you will be able to keep up your promises. Particularly, you will repay your debts even before the end date. You will help people whom you had promised. No problems are seen in your office front. Your employees will adjust themselves to your wishes. Your employers will be supportive of you. Any pending salary hike, promotions will be obtained. You will earn money from travel related jobs. You will take up frequent journeys. Entrepreneurs, businessmen, self-employed relying only on their intelligence and hard-work will have an encouraging year. This is the time for forging ahead towards your goals. Your orders will flow in steadily, Your partners will be supportive and Your income will be steady. Employees of the entertainment industry, working in television, cinema, journalists, vehicle operators, daily wagers, foreign traders, computer related jobs, teachers will prosper well. Students will travel abroad for higher studies. Those who had applied for a job at overseas will get that work. MNC employees will get to work at their overseas branches for a short period of time. People who had left off worshipping their family deity should immediately get on with the rituals to obtain the blessings of the deity. The ancient sages say that how much ever you may pray to your favourite deities, it is the family deity who comes first to save you. Women will get to buy ornaments made of gold and diamonds this year. Unmarried girls will get married while married women will get jewelry. Working women will have a successful time ahead. You will earn the respect and admiration of your co-workers. The doubts and low confidence levels assailing you for the past years will vanish. Those living with a state of confusion will feel enthusiasm lifting your spirits. Whatever bad situation you were in, you will not face them again. Whoever was acting against you will start fearing you. Debt problems will not rise. Though you might have to take up new loans, you will settle old debts. As Lord Jupiter is looking at your moon sign, you will be respected in your society. Whatever dreams, plans and ideas you have had in your mind for a long time will be realized this year.